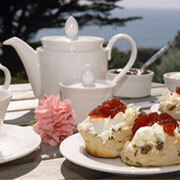 Places that serve traditional British food can now be found in most of the world's big cities. International hotels usually offer a full English breakfast of eggs, bacon, sausage and toast, plus a choice of fried tomatoes, mushrooms, baked beans and a British blood sausage called black pudding. Most big hotels also have one or two British dishes on their dinner menus. But if you want to explore British food while practising your English, find somewhere with a name like The Royal Oak or The Rose and Thistle or The King's Tavern. These places model themselves on British pubs and serve many of the same drinks and meals that pubs across the British Isles serve. 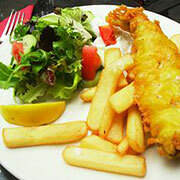 When asked for an example of British food, many people think of fish and chips. There are thousands of takeaway fish and chip shops all across the British Isles selling deep-fried fish in batter and potato chips. Like many British dishes, fish and chips began as a cheap meal for poor workers who had to survive on the very low wages their wealthy upper-class employers paid them. Takeaway fish and chips are still cheap, but more expensive versions are also now served in up-market restaurants and pubs. These can include accompaniments like prawns, calamari, oysters, coleslaw, salads and various sauces. Another famous British pub meal is bangers and mash. This also began as a meal for the poor, consisting of nothing but sausages in onion gravy plus mashed potatoes, with green peas sometimes added. Sausages are generally cheaper than meats like beef and steak, so the poor ate dishes like bangers and mash instead of dishes like beef Wellington and steak and kidney pie. Vegetables are also generally cheaper than meats, so the poor often ate vegetable-based foods like the Cornish pasty that was made by folding pastry around a spicy filling of diced vegetables with just a little meat added when possible. Many of the most famous British desserts were also invented by poor people. One of these is bread and butter pudding which is made with stale bread that would otherwise be wasted. 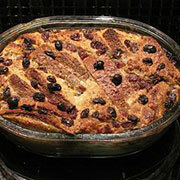 The stale bread is put in a baking dish and covered in custard, with raisins sometimes added as well. Even though it's cheap and easy to make, many people say bread and butter pudding is one of their favourite desserts. For most people the best meal of the week was eaten after church on Sundays. 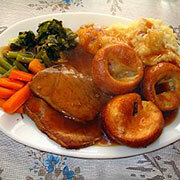 It was usually a big roast dinner called a Sunday roast, and this is still one of the most popular British meals. It consists of roasted meat, usually beef, lamb or chicken, with gravy and roast vegetables such as potatoes, onions, carrots and parsnips. A Sunday roast can also include accompaniments like Yorkshire pudding, green peas or beans, broccoli, and a baked dish called cauliflower cheese. Since the 17th century the British have used their military power to invade and control countries all over Africa and Asia. They didn't often eat the local food, but in India they discovered dishes that were so delicious they took them back home. 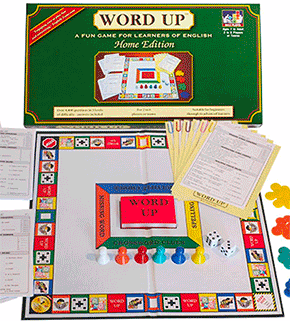 Some, like chutney, chicken vindaloo, kedgeree and a spicy soup called mulligatawny, became so popular that many people now think they're traditional British foods. The British forced Indian farmers to grow crops for British traders instead of food for their families. This caused food shortages and huge famines in India, but it also helped the British make huge profits and become even richer. One of these crops was tea, and the tea trade led to the British custom of taking afternoon tea in expensive tea houses where the wealthy enjoyed cups of tea with delicious cakes, delicate pastries and finger sandwiches. Afternoon tea is still part of British life, and one of the most popular forms is Devonshire tea in which tea is served with freshly-baked scones, jam and clotted cream. British food includes dishes from many parts of the British Isles, and like the dishes mentioned above, these dishes also reflect the past in various ways. After England invaded Ireland in the 17th century, they used Irish land, crops and farm animals to feed English armies. This made Irish people so poor that their main food became the potato, one of the cheapest foods at the time. And to this day many of the most famous Irish dishes are based on potatoes, including Irish stew, a simple dish of potatoes, mutton, carrots and onions, and shepherd's pie in which a mixture of minced meat and diced vegetables is covered with a thick layer of mashed potato. Famous dishes from other parts of the British Isles include haggis, a Scottish dish made of sheep stomach and other internal organs, and Welsh rarebit, a savoury dish from Wales made of bread covered in cheese sauce. accompaniment (noun): a food eaten with a main dish - Sunday roast can be served with accompaniments like Yorkshire pudding, gravy and cauliflower cheese. afternoon tea (noun): a light afternoon meal of tea with finger sandwiches, cakes or scones - There's a tea house nearby if you'd like afternoon tea. 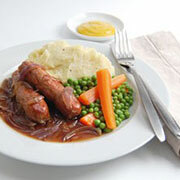 bangers and mash (noun): British meal of sausages, mashed potatoes, onions in gravy and green peas - I really love bangers and mash. black pudding (noun): a sausage made of pork fat, pork blood and oatmeal, usually sliced and fried - Does your full breakfast come with black pudding? bread and butter pudding (noun): a baked dessert made of stale bread, raisins and custard - We used all the old bread to make a bread and butter pudding. British Isles (noun): the islands of Great Britain, Ireland and over six thousand other smaller islands - The Republic of Ireland and the United Kingdom are both in the British Isles. cauliflower cheese (noun): a baked savoury dish of cauliflower and cheese sauce - I'll heat up the leftover cauliflower cheese. Devonshire tea (also "Cornish cream tea") (noun): afternoon tea with fresh scones, clotted cream and jam - We had Devonshire tea in a little tea house in the gardens. fish and chips (noun): a popular British meal of deep-fried fish and potato chips - You'll have to try fish and chips while you're in England. 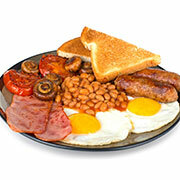 full English breakfast or full breakfast (noun): English-style breakfast of eggs, bacon, sausage, toast, baked beans, etc. - I'll have the full breakfast with scrambled eggs and tea, thanks. gravy (noun): a sauce made from the juices of cooked meat - Is there any more gravy? haggis (noun): a Scottish dish made from the stomach and other organs of a sheep - Do you really want to order haggis? 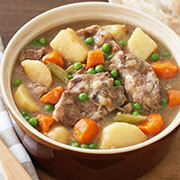 Irish stew (noun): a stew made of mutton, potatoes, carrots and onions - The Irish stew here is really delicious. 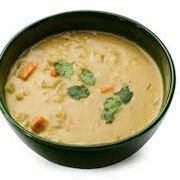 mulligatawny (noun): a spicy Indian-style soup - Mum made mulligatawny soup and we loved it. 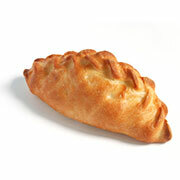 pasty or Cornish pasty (noun): a baked food made by folding pastry around a savoury vegetable filling with or without meat - I can make vegetarian pasties if you like. 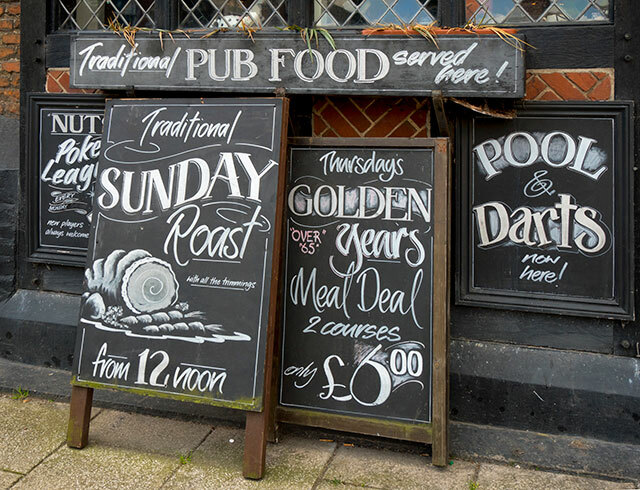 pub (also "tavern") (noun): a place that serves alcoholic drinks and food typical of the British Isles - Everyone goes to the pub for a drink after work. roast vegetables (noun): vegetables baked in a pan, often served with roast meat - The roast vegetables were perfect as usual. 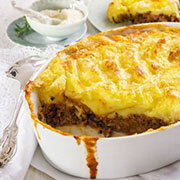 shepherd's pie (noun): a baked dish of minced lamb or mutton covered with a layer of mashed potato - You haven't tried shepherd's pie yet, have you? stale (adjective): no longer fresh, esp. of bread, cakes, pastries, etc. - I'll throw this stale bread out unless it's for bread and butter pudding. 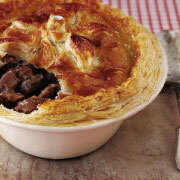 steak and kidney pie (noun): a pie filled with diced beef, kidney, fried onions and gravy - One of Britain's most famous foods is steak and kidney pie. Sunday roast (also "roast dinner") (noun): roast meat and vegetables with gravy, often with other dishes like Yorkshire pudding - Please join us for our traditional Sunday roast. 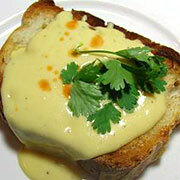 Welsh rarebit (original name "Welsh rabbit") (noun): a savoury dish of toasted bread and cheese sauce - For some Welsh rarebit recipes you also need mustard and Worcestershire sauce. Yorkshire pudding (noun): a baked food made with eggs, flour and water or milk - Yorkshire pudding has very little flavour, so you have to eat it with gravy or a sauce.